For more photos, updates and news events visit and LIKE our Facebook page. Last year, Ves Vukovic found out a good friend of his was dead. To make matters worse, although his Serbian buddy was buried in Surrey, Vukovic couldn't find where he was laid to rest. After a lengthy hunt, Vukovic eventually found his friend's grave, only to see that it had no marker. Vukovic said his grief was compounded by the discovery his friend was buried with such anonymity. So he went to work on a nice piece of granite to create a headstone. It was a year later when Anita Briscoe's older brother Jason died of cancer at the age of 46. Because of another illness, Jason had been collecting disability income, and was buried by the provincial government under a new program for people in need. In September, Briscoe found out her brother was buried without a grave marker. "It made me feel my promise to him wasn't complete," said Briscoe, who arranged for a Catholic mass in Vancouver. She had vowed to give him a proper burial. "(The grave) was still not marked, it was basically grass," she said . The family couldn't begin closure on his loss until the matter was resolved, so Briscoe was determined to work extra shifts in order to save the money for a marker. "At this point, you're exhausted," Briscoe said, adding the two-and-a-half years dealing with her brother's cancer, arranging for services, and taking care of bills as they trickled in was just about all she could bear. Then City of Surrey Cemetery Services Manager Anna Terrace called Briscoe (left, with her brother's new headstone), and said the city and a private contractor were launching a program to install grave markers for free. That program became possible through Vukovic, who is providing the markers to the city at no cost. "He deserves his name," Vukovic said in an interview Monday. "Every person deserves to be perpetuated." He later realized there were hundreds of people in the city buried in similar fashion because their loved ones couldn't afford a gravestone. As a professional carver, Vukovic decided to help rectify that. "This is how I can really express myself in the community," said Vukovic, who estimates he'll carve about 15 a year. It takes about four hours to make each stone. While he's taking care of the cost of the markers moving forward, Vukovic is unable to provide stones for existing unmarked graves in Surrey. So the city is also launching a second program to solicit community donations to enable the manufacture of memorial markers for the 350 unmarked graves currently in Surrey’s three civic cemeteries. The city of Surrey has launched a new program to help bring peace to citizens who have passed. Surrey’s three civic cemeteries contain at least 350 unmarked graves, but in future, the city will help provide families with a place to mourn. Stonemarks Engraving is partnering with the city to donate grave markers to needy families who couldn’t otherwise afford it. Families gathered at Sunnyside Lawn Cemetery in South Surrey Tuesday to see some of the new memorial markers laid — 32 have been donated this year. While B.C.’s Ministry of Social Development pays for internment in cases where families can’t afford it, they don’t cover the cost of grave markers. Surrey also hopes to be able to go back and lay markers at the majority of the historic unmarked graves in the city, and is launching a community donation campaign to launch the initiative early next year. Shirley Briscoe, mother of Jason Briscoe, blew her late son a kiss as she waited for his headstone to be set in the dewy grass of Sunnyside Lawn Cemetery on Tuesday morning. Jason was 46 when he passed away from colorectal cancer on May 23, 2013 after a two-year battle. “That’s so beautiful,” Shirley said as she looked at her son’s name and years of birth and death engraved in the granite marker. With tears in her eyes, the 85-year-old mother placed a red rose on his grave. The marker was installed free of charge through a City of Surrey initiative. While the Ministry of Social Development pays for the interment of individuals whose families can’t afford a burial or cremation, it doesn’t cover the installation of a memorial marker. The city has partnered with Stonemarks Engraving, which will provide markers to families receiving help from the ministry in the future. Jason Briscoe was one of three people whose markers were installed on Tuesday. Currently, there are 32 markers being provided through Stonemarks Engraving. The city is also launching a second program to solicit community donations to be able to provide memorial markers for the 350 pre-existing unmarked graves in Surrey’s three civic cemeteries. This program is expected to be in place in early 2014. Shirley said having a marker on her son’s grave provides her with some closure. “It makes me feel wonderful. It touches my heart. Mind you, I have such a hollow heart right now, but time will heal,” she said Tuesday. Shirley couldn’t believe it when she found out her son would receive a headstone, free of charge. “I had goosebumps. I felt so relieved and I was so elated,” Shirley said. Jason’s sister, Anita Briscoe, spoke to a modest crowd at the cemetery Tuesday and said the two were close, even as young children. She spoke of Jason’s career modelling in Paris, Greece and Milan. Anita said her brother’s last and biggest request was that he received a true Catholic mass and burial. “I promised him that this would be,” Anita said. Her family laid Jason to rest on June 7, but they were not aware the headstone was not included in the burial. Anita later contacted Sunnyside Lawn Cemetery staff and inquired about getting one. Anna Terrace is Surrey’s cemetery co-ordinator, who initiated the program to get markers for all of the city’s unmarked graves. Terrace said it’s important that all community members are remembered. “How many times do you walk through a cemetery and take a look at the names and dates and wonder who that person was. We don’t need to know their financial status, it’s proof that they were here and they existed,” Terrace said. Those wishing to donate to the project can call the city’s cemetery office at 604-598-5770 or email cemeteryinfo@surrey.ca. Surrey, BC- Friends and family gathered today at Sunnyside Lawn Cemetery in South Surrey to commemorate the installation of memorial markers on loved ones’ previously unmarked graves. The occasion was made possible by a newly implemented City of Surrey program which provides memorial markers free of charge to families in need. The City is also launching a second program to solicit community donations to enable the manufacture of memorial markers for all pre-existing unmarked graves in Surrey’s three civic cemeteries. This program is expected to be in place in early 2014. SURREY — Surrey's three civic cemeteries contain roughly 350 gravesites that do not have memorial markers identifying those buried. While the Ministry of Social Development has a program that pays for the interment of individuals whose families can't afford a burial or cremation, the program doesn't cover the installation of a memorial marker. City of Surrey staff have partnered with a local business to provide free markers to families receiving help from the ministry in the future. More than 30 families have already been assisted. Now the city is launching a sponsorship program to get markers for the 350 unmarked graves. "It's not just a patch of grass," said Anna Terrace, Surrey's cemetery co-ordinator. 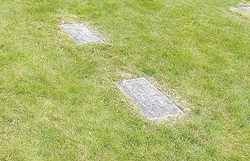 Currently, unmarked graves are just a grassy area with no indication that someone has been buried at that spot. "Imagine if you're a family member coming in, and you haven't been here for a while. There's really nothing to identify that they're even here," she said, which is very important for visiting and things like leaving flowers. "We're very proud to be able to provide this program to families. Being a city cemetery, our focus is on the community and doing what we can to help." Terrace first thought of the program last November, when a woman called into the office who hadn't been to her husband's grave in quite some time. When she went to visit him, she couldn't find his grave. Terrace met with Stonemarks Engraving, and the business offered to provide a marker to families assisted by the ministry in the future, at no charge. "I can only imagine, putting a name with their dates - when they were born and the end - that dash in the middle signifies their whole life. I can only imagine if I was in that situation that I would be honoured and thankful and just glad that a program like this is available." Terrace said it's important for the community as well. "I think it's important for our community to recognize our community members. How many times do you walk through a cemetery and take a look at the names and dates and wonder who that person was. We don't need to know their financial status, it's proof that they were here and they existed. It's very important that as we walk around the cemetery, and when we're standing in a specific spot that we recognize that was a life lived, and deserves recognition regardless of financial status." Terrace said to her knowledge, Surrey is the first city in North America to do a program like this and said she would love to see other municipalities follow suit. Owen Croy, Surrey's manager of parks, said the project is interesting from a genealogical perspective. "It's kind of neat to be able to know who is in the city cemeteries. If you go to some of our pioneer cemeteries that have been operating there for 100 years, it's really kind of neat to stroll through a little bit of history." Croy said he hopes the project will help people see cemeteries in a brighter light. "People have maybe some dark thoughts sometimes, or sad thoughts, associated with cemeteries. Other people are now recognizing cemeteries as a place for remembrance in a very positive way. We hope that this maybe moves us to more remembrance in a positive fashion." The city is hosting an event on Oct. 29 at Sunnyside Lawn Cemetery from 11 a.m. to 1 p.m. Family members will be present to witness the installation of memorials on the gravesites of their deceased relatives. "Really, by raising awareness through this modest event, we will be able to start identifying people who may be able to philanthropically contribute toward this really worthy program.... This might strike a chord with some people," Croy said. Those wishing to get involved and donate can call the city's cemetery office at 604-598-5770 or email cemeteryinfo@surrey.ca. Click on the photo for the real link. "A cenotaph monument to be dedicated this weekend at the Royal Canadian Legion Crescent Branch 240 is likely a first for North America and beyond. The memorial, to be unveiled Saturday at noon at the legion (2643 128 St.) – in a ceremony open to the public – commemorates the sacrifice of Canadian men and women who gave up their lives while serving with North Atlantic Treaty Organization (NATO) forces in the former Republic of Yugoslavia and Afghanistan. The new cenotaph will join two other memorials at the legion – one honouring the Canadian veterans who served in the First and Second World Wars, and the other remembering those who served in Canadian peacekeeping missions. “The three together will form a combined cenotaph to recognize all areas of service,” said branch president George Temperton. “As far as we know, this is the first (memorial to NATO veterans) in Canada, if not in the world,” said S“There are none in the U.S. yet and none in England,” he added. Temperton and Theriault both gave tribute to a group of business people and legion members who launched the project this spring, and Ves Vukovic of South Surrey’s Stonemarks Engraving, who has donated both the stone and his own engraving skills. The two stones that form the new monument, carved from dark B.C. granite, weigh a combined total of close to 1,500 lbs. “If somebody wanted a monument like this created, it would cost $15,000 once it’s carved and all the high-tech work is done,” said legion promotions and advertising manager Henri Wendel. Wendel noted that the legion’s mandate limits the way it can use revenues from liquor sales, meat draws and 50/50 draws – with the emphasis on grants and bursaries. “The way things are run, we can’t use the funds we raise to erect cenotaphs,” Theriault said. “It’s thanks to this gentleman that this is happening,” he added, pointing to Vukovic. Vukovic, who was born in the former Yugoslavia, said he views helping create the monument as a logical way to give back to his adopted country. An inscription on the cenotaph reads, Through this stone we touch the lives of those who served for freedom, and the creation of such a monument is seen by members as part of the mandate of the Royal Canadian Legion since its incorporation in 1926. NATO – seen largely as a peacetime military alliance – was established in 1949 as a response by Western nations against aggressive military expansion by the Soviet Union in the wake of the Second World War and fears that unstable Western European nations would join the U.S.S.R.’s communist satellites in Eastern Europe. Although the end of the Cold War and the collapse of communist regimes in Eastern Europe in the 1980s led some to question the validity of NATO, international instability and the threat of violent extremism have ensured its continuing role. The sacrifices the new cenotaph honours are very real, Theriault noted. In Afghanistan, 145 members of the military have lost their lives serving with NATO forces, and in the former Yugoslavia, 12 Canadians serving NATO troops were killed, joining 13 others killed while serving as United Nations peacekeepers. Eight of those lost in the two missions were from B.C. But the organizers of the project hope the monument is a first step toward letting such veterans know that their service has not been overlooked. “It’s open to he public and everyone is welcome to attend,” said Theriault of Saturday’s ceremony. Those intending to participate should be at the site no later than noon on Saturday, he said. " The 3 a.m. knock at the door of his Belgrade apartment was rapid. Frantic. With an abundance of caution, Ves Vukovic got up to answer, opening the door just a crack, his body blocking it from further intrusion. The door burst open and five military police charged in, sending Vukovic crashing against a wall. With the cold barrel of an automatic weapon now placed in his mouth, Vukovic was told his car was involved in a criminal incident. He quickly explained it wasn’t his car, learning only later the vehicle was registered to a previous tenant. Vukovic had just moved his family to the Serbian capital to escape the violent bloodshed in Bosnia that followed the break-up of Yugoslavia in the early 1990s. On that night, it was clear he wasn’t far enough away. He submitted applications to live in Australia and Canada, and in 1995, the approval came through to live in the latter. Getting out of Belgrade, however, would pose another problem. Rumour had it that some of the traditional aid groups were unreliable in securing exit passes for refugees. Often, applicants would be arrested the next day by military police. The authorities don’t mind if you’re a Serb, or a Croat, but they didn’t like people running from the country. Vukovic went to the United Nations Human Rights Council, where he was given the necessary documents. The 39-year-old stone carver arrived in Surrey 12 years ago. He brought with him his wife, two children, and a trade chiseled deep into his heritage. Vukovic recalls his introduction to the family craft. When he was 12, his grandfather gave him a large piece of granite and a chisel, and told him to create a perfect cube – with no marks – within a few hours. It was an initiation to a long history of stone carving. Members of Vukovic’s family have been building monuments for 450 years. Such stone workers are adept at several skills, including carving, engraving and cutting, as well as other artisan abilities. Monument building is virtually unheard of in this country, since cemeteries in the western world switched to flat ground markers in the 1930s when statues became too expensive and cumbersome. But for Vukovic, the overriding theme in his work is permanence. Good art must last a long time. Too often in this country, he says, sculptors use marble for outdoor pieces. He uses only granite and basalt, which can last for centuries. A few years ago, he searched for a “special” rock to use for a project given him by Surrey’s George Zaklan, who wanted a bust made of his parents, both Surrey pioneers. Vukovic found a two-tonne piece of emerald pearl granite in a Delta warehouse. Donning protective eyewear, with symphony music playing in the background, Vukovic went to work on the boulder with a diamond-tipped power saw. Dust plumes rose as he took away the pieces of rock that weren’t Marta and Dan Zaklan. Three months later, the boulder is lighter by 800 pounds, and has gained a highly polished definition of Zaklan’s parents. Taken from old photographs several years apart, Vukovic had to age Marta slightly so the sculpture represented the two at the same time in their lives. Bright speckles are typical in this type of granite. Zaklan is thrilled with Vukovic’s work. “I’m very impressed,” says Zaklan, a fellow Serb. “(Ves) has a huge understanding of the arts and sciences,” as well as his craft. Other works by Vukovic include a torch for veterans at the Sunnyside Cemetery in South Surrey. Currently, he’s working on a large mosaic of the archangel Michael for the Serbian Orthodox Church in Burnaby. Thousands of pea-size stones in various colours must be laid for the piece, which will be placed over the door of the church. Vukovic takes comfort in the fact his work will remain undisturbed. One of the many painful memories of his former life was watching monuments crumble in the bombing campaigns of the Bosnian conflict. However, it pales in comparison to the loss of life. Out of his high school class of 45 students, only a few are alive today. It’s a loss Vukovic carries with him, and one he’s reluctant to discuss. Asked if he’ll ever go back to Bosnia, he says he can’t muster the strength to visit friends who have lost their entire families. Maybe one day, he says, but not now. If there’s one thing he learned, it’s that nothing lasts forever – not rock, not people.